The UCLA Asian Liver Program is the only program of its kind in Southern California home to the fastest-growing population of Asians and Pacific Islanders in the United States. 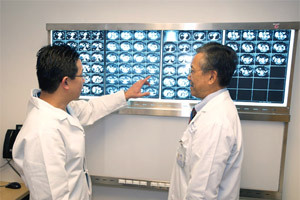 UCLA Asian Liver Program physicians treat all forms of hepatitis and other diseases of the liver, gallbladder and bile ducts. With experts in hepatology, surgery and diagnostic and interventional radiology, the program provides the full range of diagnostic, medical and surgical care. At UCLA, we have a healthcare team comprised of hepatologists and language-sensitive personnel to provide healthcare and treatment for Asian Americans with chronic hepatitis or with liver cancer. Hepatitis B virus is the primary cause of liver disease in Asians. In the United States, chronic hepatitis B is the leading cause of liver cancer, and is the second-leading cause for liver transplantation. While there is no cure for hepatitis B, there is a vaccine that prevents infection. Unfortunately, many susceptible people are not receiving vaccination to prevent this serious disease. The Silent Killer -- A significant portion of patients who are chronically infected with hepatitis B are unaware of their illness which will progress and cause major health problems such as liver failure and liver cancer. Symptoms -- Many patients with chronic hepatitis B do not have symptoms and feel healthy. When symptoms do appear, it is often in the late stage of liver disease when treatment may be less effective. Early diagnosis -- If untreated, it is estimated that hepatitis B will lead to cirrhoses or liver cancer in as many as 1 in 4 individuals. Screening for hepatitis B -- Screening is done by performing a simple and inexpensive blood test, hepatitis B surface antigen (HBgAg). UCLA surgeons have extensive experience with resective surgery (surgery to remove damaged tissue), and now offer minimally invasive (laparoscopic) procedures to treat conditions related to the liver and biliary tracts. In the hands of highly experienced surgeons, laparoscopic surgery can produce excellent outcomes with less surgical trauma, diminished pain and faster recoveries. UCLA has one of the most-experienced and successful liver transplant programs in the world. UCLA has been a leader in developing new surgical techniques that make the most-effective use of donor organs, a resource that is always in limited supply. UCLA surgeons have performed nearly 5,000 liver transplants for end-stage liver diseases and for primary cancers of the liver. Long-term outcomes for the procedure have been excellent. UCLA's expertise in liver transplantation extends to post-transplant care and adjuvant therapy. The UCLA program is at the forefront of clinical research, offering patients access to the latest advancements in immunosuppressive therapy as well as treatments for liver-transplant complications. Procedures performed by interventional radiologists are ncreasingly being used in the care of patients with cancer. These specially trained physicians use X-rays, ultrasound or other imaging techniques to guide small tubes, called catheters, and miniature tools directly to the site of the disease. Interventional radiology procedures for patients with cancer include new approaches for treatment, relieving symptoms and diagnosing cancer without surgical biopsy. What is Chemoembolization? Chemoembolization is a combination of chemotherapy and a procedure called embolization to treat cancer, most often of the liver. Chemotherapy is a treatment that involves taking anti-cancer drugs by mouth or intravenously. An embolization is a minimally invasive treatment in which blood vessels or malformations within blood vessels are occluded, or blocked off. Cheoembolization Procedure: In chemoembolization, anti-cancer drugs are injected directly into a cancerous tumor. In addition, synthetic material called an embolic agent is placed inside the blood vessels that supply blood to the tumor, preventing blood from flowing to the diseased tissue. What is Radiofrequency Ablation? Radiofrequency ablation, sometimes referred to as RFA, is a minimally invasive treatment for cancer. It is an image-guided technique that heats and destroys cancer cells. In radiofrequency ablation, imaging techniques such as ultrasound and computed tomography (CT) are used to help guide a needle electrode into a cancerous tumor. High-frequency electrical currents are then passed through the electrode, creating heat that destroys the abnormal cells.